Identifying meaningful trends from data is a goal dating back even to before computers were around to make storage and processing of information a simpler process. In the digital world we have seen trends come and go, from executive information systems to data marts and warehouses, big-ticket business intelligence systems and so on. Most of these have fallen into disuse because the software has been clunky and required specialist operators and interpreters. Despite this, survey after survey suggests CIOs and their bosses want actionable information to inform strategy and one company has emerged as the leader in democratising and simplifying analysis for the rest of us – Tableau Software. I spoke in person and by phone to CEO and founder Christian Chabot as well as fellow executives, developers, partners and users to find out more about a company that is doing for data insights what Salesforce.com did for keepings tabs on customers. Although Tableau is headquartered in Seattle, Chabot has a cosmopolitan, not to say left-field outlook. Born in the rural US state of Wisconsin, he took his degrees at Sussex University in England and Stanford. He also wrote a book about the rise of the euro currency and worked in economics consulting, and for the Japanese investment company Softbank Venture Capital before eventually co-founding Tableau in 2003. Today, he runs the company not from the Seattle HQ but from London, half the world away and the city which this anglophile American currently calls home. Chabot is friendly, dry, funny, deeply suspicious of conventional wisdom and the Silicon Valley industry nonsense that often brings out a high-pitched yelp of laughter. I start by suggesting that despite all the efforts at interpreting data, organisations continue to fail to identify what’s going on – take, for example, the banking collapse. The conundrum is answered by the fact, he says, that data analysis systems have not tended to be easy to use. This is Tableau’s calling card: make analysis so easy that everybody can do it to address their challenges and opportunities. Having recently passed $100m in quarterly revenue for the first time, built a staff of 1,700 and having established as a public company, 11-year-old Tableau is maturing fast but it has taken a different route to many, most notably in its avoidance of VCs for early capital. Chabot is similarly mocking of Silicon Valley and the faddishness for concepts. Chabot says that his original concept of making analytics available to everybody raised eyebrows at the time but it hasn’t changed. Chabot says that the next challenges will be to keep investing in research and development (spending as much in the next two years as in the previous ten) and expanding geographically and capitalise on opportunities everywhere from the UK, Germany and France to Japan, Australia, Singapore, India and Brazil. Partnering with the complementary likes of Cloudera, MapR, DataSift and Splunk will also be key. Although some observers carp and cavil, suggesting that providing more analysis tools to end users could result in anarchy and ‘garbage in, garbage out’ results, Chabot disagrees, saying that ease of use has a strong correlation with insight and that the people best able to elucidate their challenges are those at the sharp end of those challenges. And as with Google or Salesforce, users have become the company’s best sales people, evangelising on behalf of the software. Remarkable stories abound, including that of Robert Radburn who works for Leicestershire County Council’s Research and Insight team in the UK, and says Tableau is sharply reducing the time it takes for key workers to get to insights that improve services for everybody. Radburn and others noted how Tableau even “blurs the line between work and play” to the extent that they find themselves running visualisations on tablets while relaxing in front of the TV. One user even used Tableau to visualise the growth of his baby daughter. It’s a powerful formula that has driven Tableau to become valued at over $5bn. 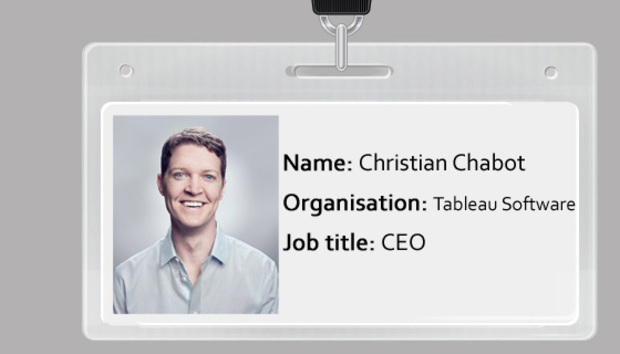 And if Chabot’s outlook and the fanatic support of users is anything to go by, Tableau could become one of the technology icons of its generation.